New Image Cut-to-Fit Convex Flextend Skin Barrier with Tape has built-in convexity means added security and skin protection for recessed, retracted and flush stomas...cut-to-fit openings. Eliminates pressure on tender post operative abdomens with the exclusive Floating Flange. Protects the skin over extended wearing time from irritating discharge. Flextend skin barrier is the barrier of choice for urostomies and ileostomies. Pouch Locking System: The patented locking mechanism attaches the pouch securely to the skin barrier, preventing unintentional separation. Bathing/Swimming Allowable: Product can be worn while bathing or swimming without affecting its performance. Easy Storage. Safe. Lightweight. Sturdy. Following Surgery. No Fuss Disposal. I prefer the two-piece ostomy system for ease of use. These barriers work like a charm. I use them with the Eakin seals and Adapt paste. Hollister sells different sizes of the bags that snap on to the appliance--easier to attach than a Tupperware seal! Earlier in rating the pouch I spoke of the convex flange and its benefits for me. I cannot emphasize that point enough because there is nothing more stressful than a leak of the flange as an ostomy wearer. I will stick by the convex configuration forever unless Hollister designs another product with similar attributes I am willing to try. 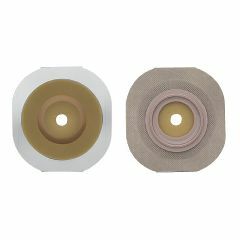 Also, as an individual who has sensitivities to adhesives, Hollister makes or utilizes the most comfortable and tolerable adhesive in this flange or any flange configuration. It is actually soothing and I do not feel the need to scratch my skin off. Thank you Hollister and Allegro.